I'm having this issue when debugging. It's happening the same in both of my environments, so I'm assuming it's actually a problem with the source jar. 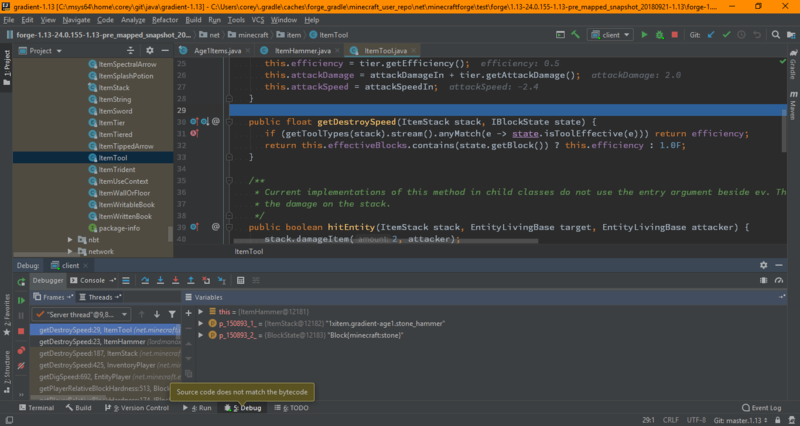 If I remove the source jar, IntelliJ will decompile the classes and debugging works fine, but obviously I lose documentation and coherent variable names, so that's not ideal. I haven't see any other mention of this, is it a known issue? This usually only happens to me if I venture deep into the launch(wrapper) code. How did you set up your workspace? The same thing happens as in my screenshot above, with the source not matching the bytecode. The source jar is attached and I can browse through it normally, but it doesn't match in debug mode. Just tried that, but no dice. Also tried with pretty much every Java 8/9/10 version and bytecode version combination possible with identical results each time.